The Remember When Institute, Culture Division officially opened yet another public exhibition to commemorate one of the many religious celebrations of the multicultural twin-republic of Trinidad & Tobago: Eid Ul Fitr. In the month of May, the unit mounted Indian Arrival Day Exhibits at three different public locations. 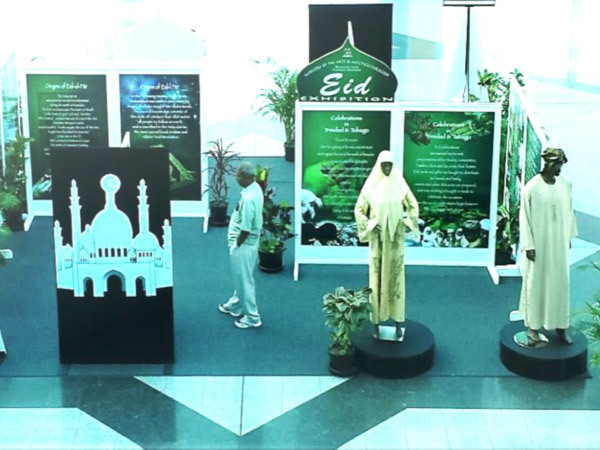 July 8th- 21st, 2015 is set aside for this year’s Eid Ul Fitr exhibitions at the Atrium of the Piarco International Airport and the Agricultural Development Bank, Chaguanas . These displays provide basic information on the Islamic religion and other culturally relevant aspects of the religion and special celebration in Trinidad & Tobago with a display of clothing, books and storyboards.